Colorful Ceiling Paint Inspiration - Wow-Worthy Ideas! 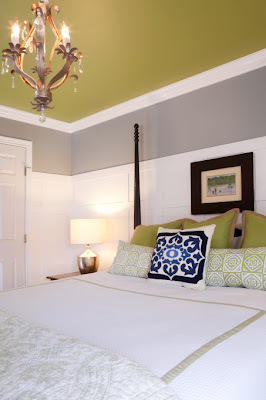 Today I’m sharing some colorful ceiling paint inspiration and ideas! I’ve painted plenty of rooms in my day. Even in grade school and high school I painted my bedroom twice. First white with dark green sponge on top (what was I thinking?) then a really perfect light green. Anyway, I love painting. I love how paint can transform a space instantly. It can make a house feel like a home. It’s just … different … unexpected … dramatic! 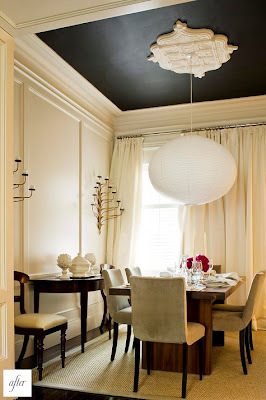 Although a black ceiling is quite … different… with the white walls (which are very tell) it works perfectly. How could you not be happy in this kitchen? 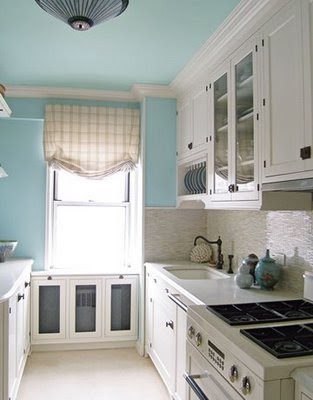 The blue walls are so cheery with crisp white crown molding and the barely lighter shade of blue on the ceiling. Amazing. Talk about drama. This purple ceiling is super cool! and see how they tied things together with the artwork in the background (the woman in the purple dress). So smart. This what what started my mini obsession with color on the ceiling. It is just the perfect mix of contemporary meets traditional. I’m really, really in love with this! Once i wrestle up the funds this will be the plan for the master bedroom here at the inn. Although I will need to change things up a bit as the adjoining bathroom has tan tile. Maybe I can make the grey stripe a little more tan? i just don’t know. More research I suppose. 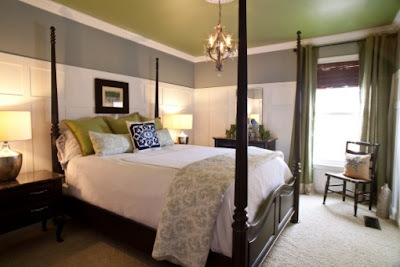 I think the one important detail is to incorporate that ceiling paint color into your room as well. See how the curtains and pillows just make Everything work? Don’t you just LOVE it? ahh. Curious about paint colors I’ve used? You can see all of my paint colors here. Hey There Michael! Just stopping by to stalk out your blog as promised! Love it!! !